Best known as one of the seven Ionian Islands, Corfu's tourist infrastructure is well developed regarding hotels and resorts. Summers crowds remain hectic, though. 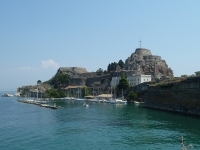 Modern Corfu Town is upbeat and cosmopolitan, offering an exciting mix of Greek, French, Italian, and British influences. By contrast, the old town was laid out by 14th century Venetians and features narrow alleys lined with multi-storied, pastel-coloured buildings, creating a scene reminiscent of Italy. Visitors looking for peace and relaxation can head to the interior. They'll find some spectacular scenery, including Corfu's various countryside orchids, and countless olive groves. Finally, there are the beautiful beaches.